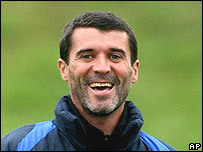 The appointment of Roy Keane as manager of Sunderland has triggered a tourist boom in the city, tourist chiefs said. The so-called "Keano effect" has led to more Irish men and women coming to the city for the football, Sunderland Tourist Information Centre revealed. Ryanair also said passenger numbers between Dublin and Newcastle have risen by 10% on Fridays and Saturdays since Cork-born Keane took over at the club. An extra 600 passengers now travel between the cities on match days. Carol Walsh, of Sunderland's tourist information centre said more Irish people, especially from Cork, were making the trip to the city since Keane joined the club in August. She said: "There are a lot of people coming to the area mentioning his name - he is a real pull for the city. "They are initially coming to see the football, but then are wanting to stay and wanting to know where to eat and where to visit to make a weekend of it. "We have always had a good flow of Irish visitors, but we are noticeably welcoming more people from Cork who are saying they are over to see the football. "Sunderland is a wonderful city and there is lots to do - we have a wonderful riverside, lots of pubs, clubs, restaurants and a great nightlife." Peter Sherrard spokesman for Ryanair said: "On an annual basis we carry about 200,000 passengers between Dublin and Newcastle which is the main point of entrance for fans wanting to go to Sunderland. "We have noticed a pick-up of 10% in passengers on Fridays and Saturdays which is an extra 600 on match days."